vacancies available in this KRIDL recruitment notification 2017. 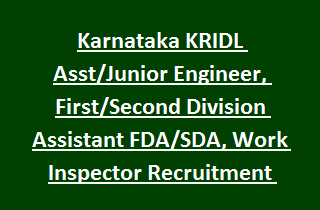 Interested candidates can apply for these jobs through KRDL official website @www.kridl.org.in. Last date to submit the online application is 24-November-2017. Starting date for online application form for this KRIDL jobs is 25-10-2017. Candidate selection for this KRIDL recruitment is based on written test and Interview. No of Vacancies, Qualifications, Pay scale, age limits and other details of Karnataka Rural Development Infrastructure Limited KRIDL AE, JE recruitment exam 2017 are given below. Click here to see the official notification of KRIDL SDA/FDA Recruitment. 2. Junior Engineer: 11 posts. 3. First Divisiona Assistant FDA: 07 posts. 4. Second Division Assistant SDA: 17 posts. Pay scale for Assistant Engineer: Rs. 22800 to Rs. 43200/-. For Junior Engineer: Rs. 17650 to Rs. 32000/-. Pay scale for other posts and extra allowances please see the official notification of KRIDL. Asst Engineer: Candidates must have completed B.E (Civil) Engineering from recognized University. Junior Engineer: Diploma in Civil Engineering from any recognized Institute. First/ Second Division Assistant: Candidate must have qualified PUC and should have knowledge in MS Office/MS Excel/ Tally. For more qualification details visit KRIDL notification. Minimum Age limit is 18 years and maximum age limit for Cat- 2A, 2B, 3A, 3B is 38 years, for SC/ ST/ Cat- 1 is 40 years and for all other is 35 years as on 31 January 2017. For PWD candidates 10 years of age relaxation will be given. Selection for the latest KRIDL recruitment 2017 is based on written test and personal interview. Admit card details, shortlisted candidates and other information regarding this application see the KRIDL notification given below. Interested/Eligible candidates may go through the Karnataka Rural Infrastructure Development Limited official website @www.kridl.org.in to and submit the application form online. Read the instructions from KRIDL notification and start filling the application form. Last date to submit the application online is 24-11-2017.